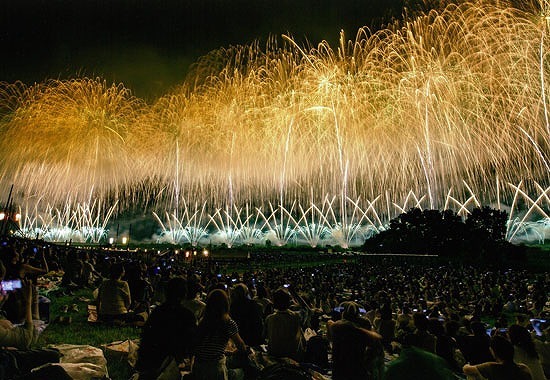 Said to be one of the three largest fireworks festivals in Japan, it is one of the most prestigious fireworks festivals in the country with as many as 1 million people attending each year. 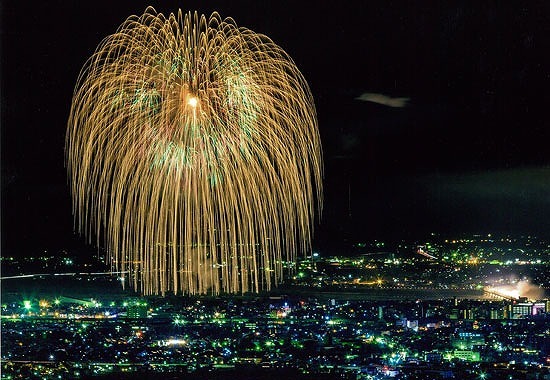 Many large fireworks color the night sky, including “Shô-Sanjakudama” which burst into a large flower 650 meters in diameter, and the enormous scale of the “Phoenix” with a length of 2 km. Despite its gorgeous fireworks display, the Nagaoka Festival originated as a war recovery festival held in the memory of the people who died in the 1945 Nagaoka air raid and that hoped for the reconstruction of the town. The Nagaoka fireworks commemorates the people who died in the Nagaoka air raid, gives thanks to the predecessors who worked hard to rebuild the town, and prays for eternal peace. Advance tickets for bleacher seating (starts at 2,000 yen). Remaining tickets will be sold the day of the event.